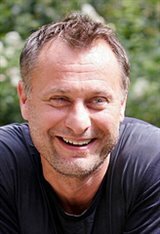 Born in Stockholm, Swedish actor Michael Nyqvist was adopted from an orphanage as a baby. He spent much of his youth playing sports such as ice hockey and football. He then spent his senior year of high school in Omaha, Nebraska as an exchange student. While there, he took his first acting classes, and his first role was a school adaptation of Arthur Miller’s Death of a Salesman. Upon returning to Sweden his interest turned to ballet, and he was accepted to ballet school. He eventually quit after one year, deciding ballet wasn’t a right fit. His passion for acting quickly reignited and at 19, he was accepted to the Malmö Theatre Academy. Michael spent the next two decades acting in mostly theatre productions. However, his first big film role came in 2000, starring as Rolf in Lukas Moodysson’s Together . For his role as an abusive and alcoholic father, he was nominated for a Guldbagge award (the Swedish equivalent to the Oscars) and won Best Actor at the Gijón International Film Festival. This was right around the time Michael found his biological parents, discovering, to his surprise, that his mother was Swedish and his father was Italian. The actor’s European film career seemed to take off from there. Next he was the leading man in the Swedish romantic comedy The Guy in the Grave Next Door (2002), for which he won his first Guldbagge award for Best Actor. In 2004, he landed his biggest role up to that point in As it is in Heaven , which was nominated for the Best Foreign Language Film Academy Award. Over the next few years, he starred in many Swedish film productions, including Mother of Mine (2006), Suddenly (2006) and Black Pimpernel (2007). He soon gained international recognition playing Mikael Blomkvist in the film adaptations of Stieg Larsson’s Millennium series — The Girl with the Dragon Tattoo (2009), The Girl Who Played With Fire (2009) and The Girl Who Kicked the Hornet’s Nest (2009). Michael had another breakthrough year in 2011 when he starred in the action thriller Abduction , directed by John Singleton; played a madman in the fourth installment of the massive Tom Cruise series Mission: Impossible - Ghost Protocol ; and earned a spot in the permanent ensemble at the Royal Dramatic Theatre, one of the most renowned theaters in Sweden. Three years later, in 2014, Michael starred as the main antagonist against Keanu Reeves in the critically acclaimed John Wick . In his last years, Michael appeared in The Girl King (2015), The Girl in the Book (2016) alongside Emily VanCamp, Colonia (2016) alongside Emma Watson and Daniel Brühl, and Frank & Lola (2016) with Imogen Poots and Michael Shannon. Michael was married to scenographer Catharina Ehrnrooth and had two children, Ellen and Arthur. In 2010, he wrote his autobiography Just After Dreaming, outlining his childhood, his lifelong search for his parents and his experiences as an actor. He died on June 27, 2017 at the age of 56 of lung cancer, before he could complete his role in the movie Kursk (2018) by director Thomas Vinterberg. Bio photo courtesy: Imago/Keystone Press via ZUMA Press. Emma Watson stars in Colonia trailer - watch it here!